Auto Tapping Machine(CLS-40GF, CLS-80GF, CLS-40GFV, CLS-80GFV) - Chen Fwa Industrial Co., Ltd.
Lead screw tool feed, one circle for one pitch. Change pitch easily and rapidly, include overload device. 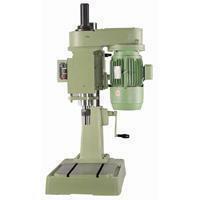 Compact, light weight, suitable for special purpose machine tools and unit construction. High productivity with multiple spindle head fitting. Change easily to left screw operation.